This has long been one of my favorite dinners. Especially in the summertime, when the shrimp are fresh and cheaper than chicken here on the Eastern Shore. It comes together quickly, taking more time to prep the shrimp than to put the dinner together – and the results are so delicious and satisfying. It’s simple enough for a family dinner after a long day at the beach, but also impressive enough to be served to guests at a dinner party. I’ll usually pair with a salad or a steamed veggie like broccoli to round out the meal. Melt butter in large skillet over medium-high heat. Toss shrimp with the salt, pepper, and olive oil. Add to the skillet. Cook, stirring occasionally, for about 3 minutes – until the shrimp turn pink and begin to curl. Add the lemon zest and garlic and cook for another 30 seconds. Add the lemon juice and toss to coat shrimp. Remove from skillet and place in a small bowl. Toss pasta with alfredo sauce to coat. 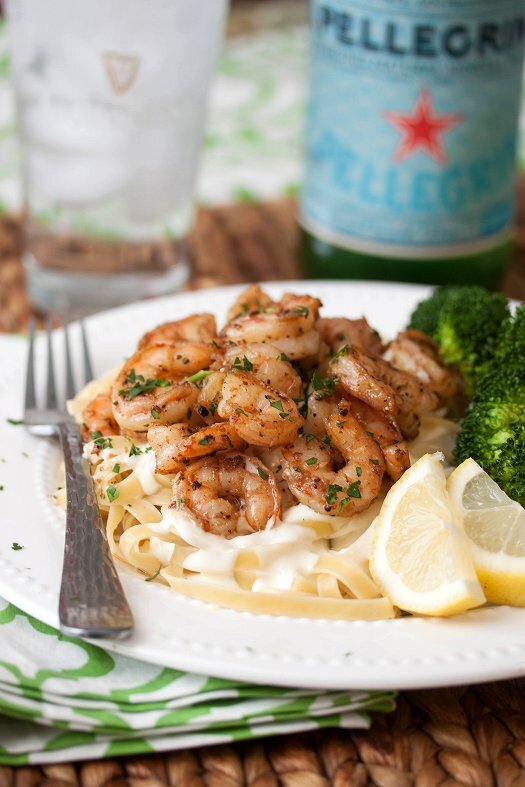 Place shrimp on top of pasta, and garnish with chopped parsley before serving.